I Liked You Better Before I Knew You So Well by James Allen Hall is a collection of moving personal essays on subjects ranging from his brother’s addiction to Hall’s first experience at a gay club, and is shot through with love, tenderness, beauty, and humor. The prose is rich, but also enlivened by dry humor and a lack of self-pity—a mastery of tone that defies easy description. Single, straightforward phrases often hold as much weight as more heartbreaking, lyrical passages. Because Hall withholds judgment—he loves these people, after all—the essays transcend simple sentimentality. Indeed, some of Hall’s subject matter is so heartbreaking that he should be commended for his bravery: a mother’s attempts at suicide, the death of a grandmother, an addicted brother. This lyrical interlude brings the reader closer to the emotional core of the essay and heightens the tension. The reader is eager to know more; the white spaces invoke the anxiety that Hall writes about. The first three essays in the collection, “My Frist Time,” “The Ends of Terror,” and “Prophecy” contend with the narrator’s experiences coming to terms with his homosexuality. He wasn’t painfully ugly. Sure, he had the normal pockets of acne, but they didn’t usurp his heart-shaped face. Rather, they flushed along his cheeks and hid near his earlobes, like little angry villages unable to mount an insurrection. This sounds like the opening to a story about an unlikely first love, but that isn’t what happens. Instead, the essay is about the cruelty of children, an interesting shift. The essay at first suggests that the “boy” will turn out to be “Jamie,” the narrator’s teenage crush. The narrator never names this “boy,” but instead the “boy” names the narrator a name that: “I had called myself that name for as many days as I had known Jamie […] I had watched myself say it, falling to the cold tile of the bathroom floor, hugging my knees to my chest, waiting for something to happen,” which zeroes in on the narrator’s identity conflict. “The Ends of Terror,” in part, describes the narrator’s first experience in a gay club. “This is the gay Shangri-La I’ve been pining for? The reality doesn’t match the brochure,” Hall writes. The feeling of being out of place, a place where the narrator will be surrounded by people that are just like him, reinforces the identity issues that Hall writes about in the previous essay and that he will write about in the next. With “Prophecy,” Hall uses hair as a lens to continue his meditations about identity. It opens with the narrator burning his hair on a dare. It is set in a college dorm room with three other men. There is another mention of a “Jamie,” but it is unclear if it is the same one that was in “My First Time.” “[Jamie is] the one who has kidded me into doing this, into making my hair an effigy. ‘Dude,’ he said, grinning at me the way boys do when they want to dare you, ‘your hair is so gay.’” Throughout the rest of the essay, the use of hair is a reflection of homosexuality. Whether it’s when the grandmother takes the narrator and his brother for their first haircuts because a friend of hers thought they were girls; or at the end, when in a motel room another man shaves the narrator’s hair off, suggesting that the narrator has taken control of his hair, and will no longer let people dare him or force him to cut it—a final gesture of self-acceptance. A similarly stunning moment occurs in “Suicide Memorabilia”, during which the narrator describes watching his mother hold a gun to her chest: “The gun makes an outline like a crooked, accusatory finger in the sweatshirt.” This is a beautiful and brave moment in the book. The language is lyrical, but also loving and devoid of judgment. Hall was able to write about such a dark moment without being cynical. 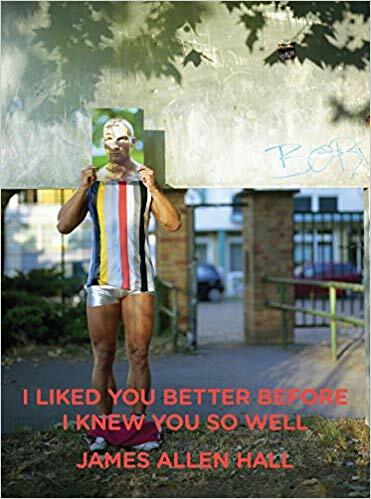 I Liked You Better Before I Knew You So Well is one of those books that doesn’t come around often. It is the rare book that possesses three key qualities: language, love, and candor. This is one of those books. This is what happens when you care about the people you are writing about, know your way onto a page, and have a story that must get out. James Allen Hall is also the author of a book of poems, Now You’re the Enemy, which won awards from the Texas Institute of Letter, the Lambda Literary Foundation, and the Fellowship of Southern Writers. He teaches at Washington College on Maryland’s Eastern Shore.